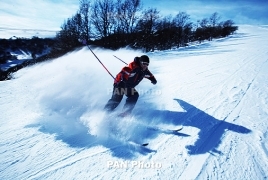 PanARMENIAN.Net - Five Armenian athletes will take part in the 52nd FIS Nordic World Ski Championships, to be held from February 17 to 28 in Seefeld, Austria, the website of the National Olympic Committee reveals. It is the second time Seefeld in Tirol hosts the world championships, the event having been hosted there previously in 1985. Skiers Katya Galstyan, Mikael Mikaelyan, Tadevos Poghosyan and Myasnik Gharibyan will represent Armenia at the event. Mikaelyan, Poghosyan and Gharibyan will compete in the men’s 15km, 30km and 50km events, while Galstyan will participate in the women’s 5km and 15km events. The Armenian skiers will also take part in the 1400m or 1600m sprint event.